Get your act together, y’all. 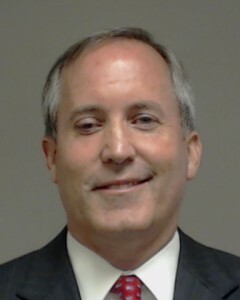 A leading organization of criminal defense lawyers on Tuesday withdrew its legal brief in support of prosecutors who are fighting to get paid for work on the criminal case against Texas Attorney General Ken Paxton. The friend-of-the-court brief, which argued that the payment fight could endanger the system for ensuring that indigent defendants are properly represented at trial, was withdrawn because it did not follow proper procedures by the Texas Criminal Defense Lawyers Association, the organization said. David Moore, president of the association, said the brief to the Court of Criminal Appeals was pulled because it had not been approved by the group’s executive committee, which unanimously voted Monday to withdraw the document. That committee will now examine the issue to determine if the brief should be approved or if the matter should be decided by the full board of directors, said Moore, a lawyer in Longview. “The larger question is why Mr. Paxton’s defense team does not want the Court of Criminal Appeals to consider” the brief, Wice said, adding that it raised compelling points about the payment fight’s impact on public policy and proper legal representation for indigent defendants. “I will not have any further comment on the matter now except to express my grave disappointment in the impropriety of the filing of such a pleading in a case of this magnitude and am gratified that the proper steps to correct the situation have begun,” Cogdell said. Austin lawyer David Schulman, one of the brief’s authors, said he and others involved believed they had followed the organization’s bylaws, but he declined to discuss specifics. “This wasn’t any kind of guerrilla action. We thought we were authorized, but we were wrong,” he said. See here for the background. It’s clear that the arguments made in the TCDLA brief would be good for the defense bar as a whole, but not good for Team Paxton, as they would greatly benefit from having the courts screw the special prosecutors in their case. As Mr. Spock famously said, the needs of the few outweigh the needs of the many. I hope there are enough people with a larger view of things at the TCDLA who can override these objections. With exoneree Michael Morton by his side, Gov. Rick Perry on Thursday signed a measure that aims to avoid wrongful convictions by preventing prosecutors from suppressing evidence. “This is a major victory for integrity and fairness in our judicial system,” Perry said of Senate Bill 1611, which was named for Morton, who spent 25 years in prison before being exonerated. It was the governor’s first public signing ceremony of the session. Under SB 1611, prosecutors will be required to turn over evidence to defendants accused of crimes and to keep a record of the evidence they disclose. The landmark 1963 U.S. Supreme Court ruling in Brady v. Maryland already requires prosecutors to give defendants information that is “material either to guilt or to punishment.” The Morton Act requires disclosure of evidence regardless of its materiality to guilt or punishment. 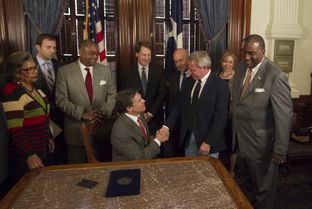 It is the first significant reform to Texas discovery laws since 1965. State Sen. Rodney Ellis, D-Houston, who co-authored the bill with state Sen. Robert Duncan, R-Lubbock, said the bill’s passage represented “an important milestone in the journey toward justice in Texas.” Duncan said the legislation would help preserve liberty in the state. After signing the bill, Perry handed Morton the pen he used to do it, and state Rep. Senfronia Thompson, D-Houston, presented Morton with the gavel used to mark the passage of the bill in the House. Well done all around. When SB1611 was first introduced, it was opposed by the Texas Criminal Defense Lawyers Association on the grounds that it would have also required defense attorneys to open their files to discovery, much like prosecutors are required to do. I hadn’t followed this bill very closely so I wasn’t sure if the TCDLA was now on board with SB1611 – their website and Facebook page give no indication that I could find. I eventually found a comment by TDCLA President-elect Bobby Sims on this Grits post (scroll all the way down; Sims’ handle is Longhorn74) which makes it clear that in the end the TDCLA did support SB1611. All’s well that ends well. It would be nice if there were an equally happy ending for HB166, the bill to establish an Innocence Commission, but that doesn’t appear to be the case. One step at a time, I guess. There’s a bit of controversy brewing over one of the criminal justice reforms that have been proposed. The bill at issue was filed on deadline day. Senate Bill 1611 would enact uniform discovery requirements in criminal cases across Texas. It would require prosecutors to give defense lawyers evidence in their files and to include essentially everything except their own notes about strategy. It would require defense lawyers to share evidence as long as it doesn’t include their strategy plans or violate the defendant’s right against self-incrimination. The measure also spells out that lawyers on both sides would have an ongoing duty as the case continues to reveal information, and it would provide sanctions in cases where the discovery requirements are violated. [Sen. Rodney] Ellis, D-Houston, said the bill would make the justice system fairer and save taxpayers money that is often spent in long, expensive court battles and on compensation to those who have been wrongfully convicted. Nearly every other state has discovery requirements similar to those outlined in SB 1161, and requiring reciprocal open discovery was a recommendation in the August 2010 report from the Timothy Cole Advisory Panel on Wrongful Convictions. Then-state Rep. Pete Gallego, D-Alpine, filed a similar bill in 2011, which did not pass. Under current law, prosecutors are required only to divulge basic information about the crime to a defendant’s lawyer, and they’re only forced to do so if a judge orders it. Ellis and Sen. Robert Duncan are the authors of this bill. I was curious to see how the defense bar would react, since they had raised concerns about the direction of this legislation before it was filed. It seems their concerns have not been assuaged. The Texas Criminal Defense Lawyers Association this weekend approved a resolution opposing the legislation. “The only ones who ought to open their files is the prosecution; they have the burden of proof,” said Bobby Mims, president-elect of the association. Momentum to pass legislation that requires both district attorneys and defense lawyers to share their files has grown in the wake of wrongful convictions in which prosecutors allegedly withheld critical evidence. Such laws, proponents argue, would prevent convictions like that of Michael Morton, who was exonerated in 2011 after spending nearly 25 years in prison for his wife’s murder. His lawyers allege that the district attorney in Morton’s case deliberately kept information from defense lawyers that could have prevented his conviction and led to the real killer. Morton himself has supported legislation to require open discovery. Some criminal defense lawyers over the last decade have led the fight against reciprocal discovery proposals in Texas. The association says the measure is unnecessary, would result in a flood of expensive, unneeded paperwork and would give prosecutors too much access to their clients’ information. It is the prosecution — not the defense — that bears the burden of proof in criminal cases, and defense lawyers argue they should not have to reveal their clients’ hands. What’s more, they say the legislation would do nothing to prevent tragedies like Morton’s. Though they are not required to do so, Mims said, most prosecutors in Texas already have some type of open file policy that allows defense lawyers access to evidence against their clients. Ellis’s legislation, he said, would require expensive and lengthy document production that would drive up the cost to taxpayers who foot the bill for indigent defendants. And he worried that the requirements would inundate lawyers with unnecessary files. But the biggest worry for defense lawyers, Mims said, is that providing witness lists to prosecutors could lead to witness intimidation. “The fact that a prosecutor is ethical doesn’t mean his investigators or other police officers are, too,” Mims said. For all the heartburn it is likely to cause, Mims said, the law would not prevent what happened to Morton from happening to others. No legislation can ever stop a police officer or prosecutor who wants to hide evidence, he said. Instead, he said, the TCDLA strongly favors Senate Bill 825, a measure by state Sen. John Whitmire, D-Houston, which [was] heard Tuesday in the Senate Criminal Justice Committee, which the senator leads. The measure would extend the statute of limitations for offenses involving evidence suppression by district attorneys. Under current law, the four-year statute of limitations begins ticking on such offenses when they occur. Whitmire’s proposal, which Morton also supports, would begin the clock on the statute of limitations at the time a wrongfully convicted defendant is released from prison. The association also supports House Bill 166 by State Rep. Ruth Jones McClendon, D-San Antonio, which would create an innocence commission to examine wrongful conviction cases and recommend improvements to the criminal justice system to prevent them in the future. The Texas Defender Service supports SB1611, but as you saw in that earlier link that didn’t cut any ice with the TCDLA. I’m not an attorney, let alone a criminal defense attorney, so I do not presume that I understand this issue better than they do, but I am curious about something. If it really is the case that most other states do things the way the Ellis/Duncan bill would have Texas do, is it truly that Texas’ way is better, at least from a criminal defense perspective, or is it just that Texas’ way is good enough and it’s not worth mucking with? Like I said, I’m just curious. In any event, Sen. Whitmire’s SB 825 has passed out of committee, and that would unquestionably be a step forward. Grits has an excellent writeup about it. We’ll see how it goes with SB 1611. Schneider, a Houston lawyer, said a Bradley-devised system of subcommittees designed to collect investigation evidence, accept citizen complaints and handle other matters “very likely” violates the Texas Open Meetings Act. In response to my emailed request, Keith Hampton of the TCDLA sent me a copy of the their statement, which I have reproduced beneath the fold. Like Grits, I hope the TCDLA pursues the open meetings angle, which based on the story and Grits’ analysis seems likely to be a winning argument if a lawsuit were to be filed. Someone needs to hold John Bradley accountable for his actions.